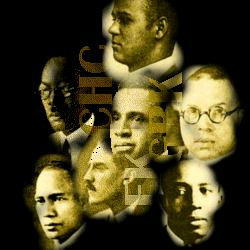 The founders of Alpha Phi Alpha Fraternity, Inc. were no ordinary achievers. Given racial attitudes in 1906, their accomplishments were monumental. As founder Henry Arthur Callis euphemistically stated—because the half-dozen African American students at Cornell University during the school year 1904-05 did not return to campus the following year, the incoming students in 1905-06, in founding Alpha Phi Alpha, were determined to bind themselves together to ensure that each would survive in the racially hostile environment. In coming together with this simple act, they preceded by decades the emergence of such on-campus programs as affirmative action, upward bound and remedial assistance. The students set outstanding examples of scholarship, leadership and success—preceding the efforts even of the NAACP and similar civil rights organizations. Who, after leaving Cornell University, entered the field of medicine. Jewel Callis was born January 14, 1887 in Rochester, NY to Reverend Henry and Mrs. Helen Sprague Callis. He graduated from Central High School in Binghamton, NY in 1905. In the fall of the same year he entered Cornell University and took a part time hob as a janitor and waiter in a white fraternity house. After graduation from Cornell in 1909, he went to Rush Medical college and obtained his MD Among his professions, he served as a professor of medicine at Howard University and as a medical doctor at VA Hospital of Tuskegee, Alabama. Jewel Callis is the only Jewel to serve as General President, and he was the last one to enter Omega Chapter (November 12, 1974). Who, after leaving Cornell University, chose the field of education as his profession. Jewel Chapman was born in 1876. Before entering Cornell, he attended Howard University. He also attended Michigan State University and Hampton Institute. From 1923 to 1934, he served as an instructor and dairyman on the Agricultural Staff at Florida A & M University. He was a lover of animals and instrumental in organizing work in animal husbandry on the college level. Jewel Chapman was known to be very frank in his opinions and stringing in his convictions. On November 17, 1934, Jewel Chapman died in Tallahassee, Florida, becoming the first founder to enter Omega Chapter. Was a member of the first committees on Organization, Constitution, and Pins, President of Alpha Chapter and maker of Beta and Gamma Chapters as well as Alpha Lambda (the first graduate chapter). He occupies a dual place in the history of the Fraternity. He is the seventh Jewel and along with Lemuel Graves and Gordon Jones, he is one of the first initiates. Jewel Jones was born July 30, 1885 in Richmond, Virginia to Joseph and Rosa Kinckle Jones, both professors at Virginia Union University. Jewel Jones' early education was obtained from Wayland Academy. From 1902-1906, he attended Virginia Union University, where he received a B.A. degree. He entered Cornell University Graduate School of Sociology in the fall of 1906. He graduated from Cornell with a Masters of Arts Degree in 1908. The following year he married Blanche Ruby Watson. Jewel Jones entered Omega Chapter on January 11, 1954 in Flushing, Long Island, New York. Who, after leaving Cornell University, became a civil engineer. Jewel Kelly was born in 1884 in Troy, New York. He worked in private industry and for the New York State Barge Canal upon graduation from Cornell. He married a young lady named Harriet. Jewel Kelly left his work with the Barge Canal and transferred to the department of Taxation and Finance of New York State where he served for over thirty-two years. In his retirement, he conducted a successful practice as a tax consultant. While at Cornell University, Jewel Kelly served as the first president of Alpha Chapter. During his life, Jewel Kelly never missed a convention. He entered Omega Chapter on May 5, 1962 in Troy, New York. Did undergraduate and graduate work at Cornell University, and later entered the field of education. Jewel Murray was born to Daniel and Anna Evans Murray in the 1880's. After finishing Cornell, he served as an instructor in science at the Armstrong Manual Training School. His first cousin Joseph H. B. Evans served as General Secretary of the Fraternity. Jewel Murray entered Omega Chapter on December 6, 1959 in Los Angeles, California. Who, after leaving Cornell University, entered the secretarial field, and had the unique privilege of being attached to the Office of the Committee on Appropriations of the United States Senate. Jewel Ogle lived at 411 East State Street during his matriculation at Cornell. He was noted for his excellent spencerian penmanship and served as the first secretary of Alpha Chapter. On December 3, 1936, in Freedman's Hospital in Washington, D.C., Jewel Ogle entered Omega Chapter. Who, after leaving Cornell University, became a registered architect. Jewel Tandy was born on May 17, 1885 in Lexington, Kentucky to Henry and Emma Brice Tandy. Jewel Tandy's early education was obtained from the Candler School in Lexington. In 1904, he entered Tuskegee Institute. The following year, he went to Cornell University clad in a Cadet uniform and with a saxophone under his arm. He became a student at Cornell and roomed with Jewel Eugene Kinckle Jones. In 1908, he graduated with a degree in architecture. He led a fight to have black women accepted at Sage College and won. He married Sadie Dorsette in 1912. During World War I, he became the first Black man to be commissioned an officer in the State of New York. Jewel Tandy entered Omega Chapter on November 7, 1949.